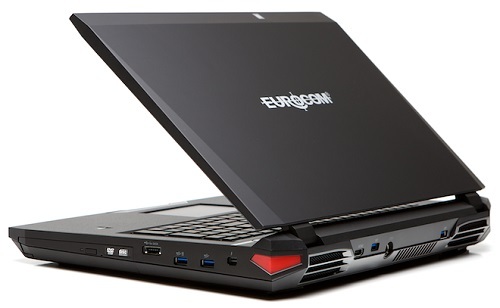 Eurocom is currently offering a 25% Trade In discount when trading in any Eurocom laptop to the X7 until October 15, 2014. Eurocom offers professionals, gamers and enthusiasts total control of their fully customizable EUROCOM X7; single or dual NVIDIA GeForce GTX, Quadro or AMD Radeon graphics can team up with an optional 32GB of DDR3-1600 RAM, Intel Core i7 Extreme Processors, RAID 0/1/5 capability with SSD, HDD and mSATA support to create blazing mobile performance. “Customer can now trade in their current Eurocom notebook and receive 25% off one of the most advanced, high performance, laptops in existence” Mark Bialic, Eurocom President. The Thunderbolt port on the X7 provides unprecedented expansion capabilities, transforming the EUROCOM X7 into a complete desktop workstation. “The EUROCOM X7 is a computing beast, being fully configurable it supports an Intel Core i7 Extreme processor, dual video cards, 32 GB memory and 5 storage drives. There’s not much this beast can’t do.” Mark Biailc, Eurocom President. The EUROCOM X7 is perfect for High Performance Computing on the go, it is VGA upgradeable in order to meet future performance and technology needs of users. Being fully customizable and amazingly flexible, the X7 can be filled with a plethora of top quality, high performance technology to fit a variety of needs. Many of our customers utilize their EUROCOM X7 system for game development, engineering, design, software development and other activities that involve valuable intellectual property information. Due to this, we feel the need to provide them with the utmost in secure computing to keep their information and livelihood safe and secure with a Trusted Platform encryption Module, Finger print reader and lock port. Personalize your own X7 weapon with a custom backlit keyboard, with 7 colours, 3 zones and 8 modes. A sleek, customizable light illuminates the keyboard, hinting at the power held within the aggressively designed chassis. The X7 supports beautiful full high definition 1920x1080 matte displays and 120 hz panels are also available. High definition audio, ONKYO sound and Sounds Blaster X-Fi enables users to hear the enemy creeping right up behind them.